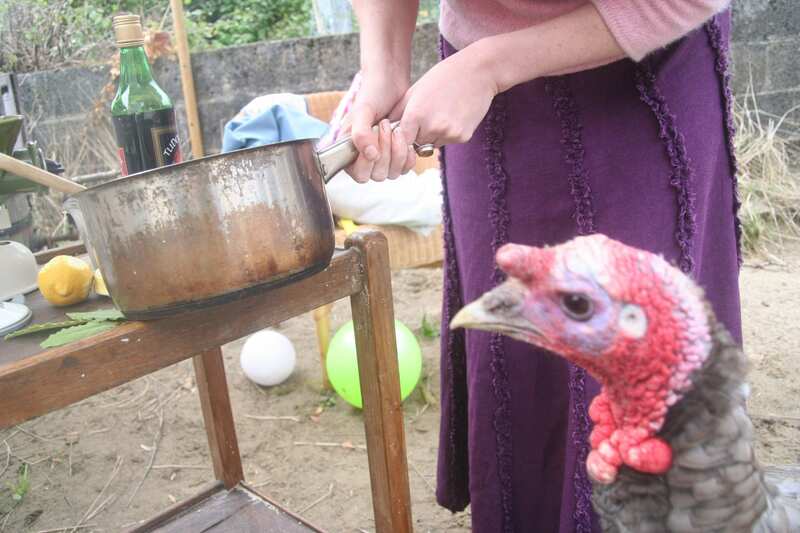 Before the weather becomes too cold I decided to do my last little bit of open-air cooking in the garden and this is when I realised the peril of having a pet turkey stag. At the sound of a clanking saucepan and the glimpse of food, Mani the turkey was over to offer assistance as chief taster. No amount of dried corn or coaxing could encourage him away from the cooking. He took great interest in all the proceedings and I’m seriously thinking of entering him as a contestant on next year’s British Bake-Off. On the subject of baking I was delighted to give a talk at the Cardiff Story Museum on the history of cake. I popped into the BBC Radio Wales studio to have a chat on air with presenter Eleri Sion about the traditional cakes of Wales and even gave her a little sample of a cake made to a Tudor recipe before plugging the talk at the museum. The talk went very well and in the space of two hours I explained the history of our beloved cake and how its shape, taste and form has changed over the course of hundreds of years. All the baking and talking about cake really got me thinking about cakes from my childhood and it wasn’t long before I came to dwell on fairy cakes. Fairy cakes are the most British of institutions and whilst in stature the cupcake may tower over the petite and dainty little fairy cake, I stand firm in my liking of the simple and delightful fairy cake. To steal a term from ‘British Bake Off’, cupcakes can be a little style over substance in my opinion, for whilst they are often elaborately and beautifully designed they can be overly sweet with a heavy sponge base. The fairy cake on the other hand has beauty in its simplicity; its light sponge is simply decorated, providing the perfect balance between sponge and topping. Quick and easy to make they are the perfect size for little hands and mouths. It is easy to eat a fairy cake with dainty eloquence. The name “fairy cake” owes its name to its dinky size and is a fanciful reference to the cakes being the appropriate size for a party of diminutive fairies to share. Well, my fairy cake recipe below is ideal for a group of very grown up children to share as it contains freeze dried passion fruit and amaretto liqueur – it just goes to show that you are never too old to eat fairy cakes. Preheat the oven to 180◦c/ fan 160◦c/ Gas mark 4. Put fairy cake cases into a 12-hole muffin tray to ensure that they hold their shape whilst baking. Measure all the ingredients into a large mixing bowl and beat until smooth. Divide the cake mixture evenly between the cake cases. Bake in the pre-heated oven for 20-25 minute, until golden and well risen. Remove the cooked cakes from the muffin tin and place the fairy cakes on a cooling rack/wire rack. Allow the cakes to cool completely before attempting to ice. Sift the icing sugar into a bowl and mix in the passion fruit powder with it until well combines. Gradually add in the warm lemon juice and mix vigorously. The result is a glossy icing that can be used to decorate the fairy cakes. I do hope you will try this recipe and let me know how you get on. Now I am off to enjoy a good cup of tea and one of my fairy cakes. Until next week I wish you a fond farewell from my corner of West Wales. WEEKENDS OF FOOD AND FUN! « YASMINE SMART; A CIRCUS DYNASTY.